Northern Expressions Needlework: I've Been Inked! Wow it's been a busy few weeks. Printing, packing, mailing, working out, cooking... notice what's missing? Stitching. I haven't touched a needle in two weeks - and I've been on holidays. WHAT is wrong with me??? The desire is there but time is elusive! Here is what it currently looks like. Nate did a little bit of outlining in blue to show me it looks better - he's right, and I will be going back so he can finish that up in a few weeks. He also wants to make the fade from blue to purple more gradual. And apparently (not that I can see them) there are a few spots where the ink didn't take as well so he wants to go over those. I think he was afraid of hurting me - I'm his momma after all. I've got him working on some ideas for filligree or maybe vines and flowers to come out from the sides eventually. Just a note - it's addictive. I'm already plotting out several more I want to have done. 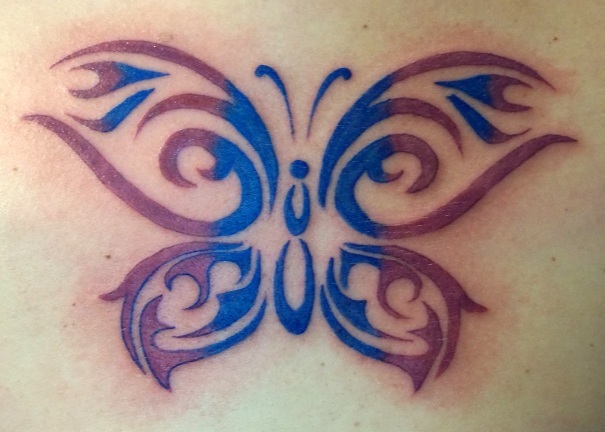 :D I chose a butterfly because it symbolizes change, and I'm going through a whole metamorphosis of my own right now. Today I'm going to relax and attempt some stitching after my workout, then off to dinner with my cousin. Tomorrow is shopping for some new clothes that actually fit (not into my size 4-6 stuff yet, but everything else I have is HUGE) AND I'm getting my hair chopped off. Thinking of going really short for something different - kind of follows along with my whole transformation. :) Then possibly going up north (further north that is) for the weekend before heading back to work on Tuesday, though I may forego that and just spend the weekend at home relaxing and getting some design work done. I FINALLY got all the prize packs sent out on Tuesday. So sorry to take so long but it's been, well, crazy is the only way to describe it! Wow, love the tat. It's beautiful. I'd love to get another too. Sounds like it's been crazy busy, but at least you're not bored, lol. Have a good weekend, Nicole!! Your amazing prize arrived yesterday! I'm bowled over by the designs and keep re-arranging them in the order I want to stitch them. Great tattoo too, it is addictive LOL.